I served a total of 8 years active duty in the US Navy. The last two years I spent “forward deployed” serving aboard a destroyer (USS Bausell DD-845) homeported in Yokosuka, Japan at the US Naval Base there. While aboard that ship I found myself doing as I had always done … faithfully writing letters to my family (parents, sister & brother) as well as a few friends. I also received a lot of letters. When my sister would write to me she would always include something like “God bless you” near the end of her letters. I prided myself as being an atheist totalling rejecting the concept of a God Who existed. I was about 29 years old at the time. Looking back now I can readily and truthfully say that I am convinced that the reason I chose not to accept that there is a God is because if I did that would mean I was accountable to Him. This matter of my sister making reference to God in her letters as I mentioned didn’t sit well with me. It infuriated me in fact and I took it upon myself to put a stop to it. I wrote back to her and told her to “knock it off or stop writing to me”. She stopped writing. At first all was fine. I didn’t have to see those words in mail I was reading. However it did not take long before I started feeling guilty for the riff I had caused between my sister and I. I was uncomfortable with it but it went on that way for a long time. There was a crewmember aboard ship that stood out from everybody else. I didn’t understand much about it then but now I do … as to why this man stood out from everybody else. I felt sorry for this man because most of the crew gave him a very hard time and treated him unkindly and made fun of him. He did nothing to deserve it and never said or did anything back to those who did this to him. One day while I was on watch (sounding & security watch where I roamed around the entire ship checking for any problems like fire, flooding, equipment failure, etc.) I went down to what is known as the “refer deck” where our ship’s refrigerated and freezer rooms are at. This man happened to be down there getting something as he was assigned to mess cook duties at that time. We greeted each other and struck up a bit of conversation. He asked me how I was doing and I felt somehow ‘compelled’ to tell him about what had happened between my sister and I. He encouraged me to write to her and apologize to her and assured me that everything would be okay if I were to do this. I listened to him but I didn’t do it. I just thought about it. A few months passed by before I found myself running into this guy again. This time it was in the passageway back in front of the ship’s store. He asked me if I ever wrote the letter. I told him I hadn’t and once more he encouraged me to do so. I knew I needed to but was having a difficult time getting myself to do it. Finally I decided to do it. It was nighttime and we were out somewhere in the western Pacific ocean as we usually were. The sky was clear of clouds and star filled. It was a beautiful night. 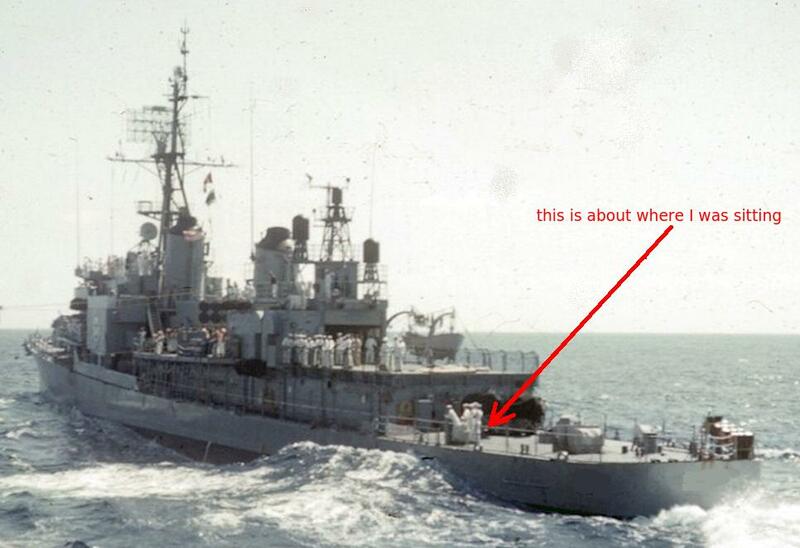 I was sitting out on the fantail (the rear of the destroyer ship as shown in the picture above … about where the red arrow is pointing). As I sat there I felt somehow drawn to say a prayer … a prayer to a God I did not believe in … didn’t believe even existed. I looked up into that star filled sky and said something as simple as “God, if You are real, prove Yourself to me”. Now I know now that God does not owe us any further proof than He has already given us and we are without excuse before Him as to our accountability to Him, but I also know that He loves each and everyone of us enough to answer a prayer like this if we are sincere in our hearts with Him. And He knows our hearts! In praying that prayer I guess I was hoping for something ‘supernatural’ to happen before my eyes so that I would believe in Him. I was disappointed that night. Nothing happened! I went to sleep like all other nights and life went on as before. At least that is what I thought then for you see something supernatural did happen … I just wasn’t aware of it. By praying that prayer I had opened the door for God to start working ‘behind the scenes’ on my behalf so to speak. Actually I believe He had been doing so before this and this matter of my sister and I was a part of it as was this man aboard ship God had placed there in my path. Oh how I wish I knew his name and how to contact him. Did I already say that? Well, my life went on as before and my sister and I continued to correspond. All was well. A few more months passed by and finally the big day came for which I was so thankful. I got out of the navy and returned to civilian life. Initially I lived with my parents where my younger brother was still living at that time. He had already been into learning about what I will refer to as “the one world government movement” and occasionally he would talk to me about it. I could readily grasp and agree with him about some things he told me but there were other things I just had a hard time accepting. Then he gave me a small book to read which convinced me to the reality of all he had been telling me. The best way I could describe all of this is to use a large picture puzzle as an illustration. Let’s say that you were sitting at a table when I walked up to you with a box full of 1000s of pieces of a jigsaw picture puzzle and just dumped them all out in front of you on the table. Then I said to you … “Here, put this together” and just walked away from you without giving you the box showing what the puzzle is supposed to look like when all the pieces are fit together in their proper place. That would be a very difficult feat to accomplish. I am sure you would agree. These puzzles are difficult to put together when you have the completed picture in front of you to use, much less to try it without it. This book I read showed me how all the pieces fit together and that indeed the picture was one of one world goverment. Former U.S. President, George H. Bush, often used the phrase “new world order”. That phrase is nothing new. It has been around for at least as long as our nation. You will find it inscribed on our paper currency. 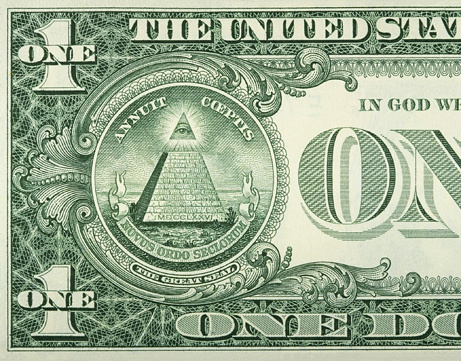 Just look at the back side of a $1 bill and you will see the “Great Seal” with the all seeing eye at the top of the pyramid and the Latin words “Novus Ordo Seclorum” under the pyramid. Those Latin words translate into New World Order in English. This image I have just described is an occultic image. Now that being said I have just recently also read otherwise … that all of this is based on the true things of the God of the Holy Scriptures and not on Satan and his kingdom. So I really don’t know what to believe about it all. I would sooner believe the former as I know what people are up to and it most definitely is not of God. What I do know is that God used it as part of what it took to answer my prayer. So on with my story … Once my brother had my full attention by sharing that book with me I too started reading more about all of this, listening to tapes, and going to hear a few speakers address the topic. I “self educated” myself and learned a lot about this new world order. It was fascinating but also very scary as I love my country and don’t want to see it destroyed by those who want this new world order. My brother and I both joined the John Birch Society in an effort to do what we could to learn more and try to stop all of this from happening. Up until this point in time we had not attempted to share any of this with our family (parents or our sister) but we made a trip to see our sister and visit with her and her husband. They used to be Roman Catholics but something happened to change all of that. I didn’t know a lot about it then but I was glad they were no longer Catholics as I had always thought that if that is what “religion” is all about I want no part of it. Thankfully my brother-in-law was thinking the same way and questioned the Catholic religion he had been a part of all of his life. He had started looking into the bible and checking out other churches. (It is so sad that most do not study God’s Word and understand what it says cause if they did these false religions wouldn’t exist … nobody would be involved in them.) In his quest along with my sister they had got into various things including a cult (Jehovah’s Witness) which thankfully they got back out realizing something was wrong there. The key to all of this is God’s word … the bible … the holy scriptures. If it were not for the fact that my brother-in-law was checking out God’s Word thruout this time they might have very well continued on in that false religion and been deceived into believing things that are not in accord with God’s word. Satan is real and is out to deceive everyone he can and cause them to miss what God has for them … which translates into taking them to hell with him. For a person can be most sincere in what they believe but if they are believing something which is wrong all they really are is sincerely wrong. So here my brother and I are visiting my sister and her husband. We were quite anxious to share with them these things we had been learning about this one world government movement and had hoped to get them involved as we were to educate others and stop this movement from happening. As we shared with them we were very surprised to find out that they already knew a lot about it. We could not figure out how this could possibly be as we were pretty certain that they had not studied the same sort of stuff we had been studying. Then they informed us that this is all part of “end time bible prophecy”. That was like dropping an atom bomb on us … a real awakening. Neither my brother or I knew much about the bible. I had only a couple of times in my life opened a bible and attempted to read it. And the only bible I had seen was the King James version of the bible … something I despise to this day as it is written is a language which we do not use anymore and is not only so very difficult to understand but is known to have many errors in translation. Some of the old English words have entirely different meanings today than what they had back when that version was first published. Some words have the exact opposite meaning today than they did in 1611. Anyway, in my early attempts to read it when I was younger I found it extremely boring and too difficult to understand so I never attempted to read it again. I have learned something about the bible since then which is a good part of the reason I couldn’t understand it earlier. It is not only a matter of the old English but even more importantly it is a matter of the bible being a “supernatural book”. Our minds are “natural” and therefore are not able to deal with supernatural. We can’t understand it … not with our natural minds. We need a “supernatural mind” to understand a supernatural book. Only God can provide us with a supernatural mind and He only does that when we are sincerely seeking the truth to be found only in His supernatural book. Someone once said of the bible … “The bible is no ordinary book. Man (by himself) could not have written it if he wanted to and he would not have written it if he could have.” Anyone who truly understands God’s word would readily identify and agree with this. As my sister and her husband are sharing with us we listened intently as all of this “arrested us” and had our full attention. Just before leaving their home they gave both of us a few “tracts” to take home and read. All but one were Jack Chick tracts. I had seen these while I was in the navy and had even read a few of them, but they had no effect on me at that time. This is a key thing as well. Unless the Holy Spirit is drawing us and dealing with us we are not at all in tune with the supernatural spiritual realm. I had prayed that prayer for God to prove Himself to me. Right there, right then He was answering my prayer!!! The Chick tracts I was reading which my sister and her husband had given to me were interesting reading as they were about end time prophecy but it wasn’t until I got to the one piece of literature … the last one I had … which was the pure word of God … not a tract … that God used to speak to me. I was reading the Gospel of John in the Living Bible … not a translation but a paraphrase. None the less, it was powerful. As I read it God (the Holy Spirit) helped me to understand the truth and fully convince me of it. Now the word gospel means “good news” and that is exactly what it is … very good news indeed. But in order for us to understand and appreciate the good news it is imperative that we first understand that there is bad news. It is bad news for all of us. If someone walked up to you and told you that you are going to hell that would be bad news for sure. That is exactly what God did. He told me I was going to hell and He explained to me the reason why I was going to hell. I had no argument with Him as I understood I deserved this fate. But then He gave me the good news. I didn’t have to go to hell … He provided a means for me to escape this fate I deserved and have in its place a promised future I was not deserving of … to spend eternity with Him in heaven. He had made a way for this to happen that didn’t exist previously. Some 2000 years ago God left His throne in heaven and came to earth to be born as a human baby and grow up to be the only means by which I and anybody else who so desired could escape this death sentence of being hell-bound. It was necessary for Him to do this Himself as only He is perfect and pure and holy. Only He could meet the requirement of a perfect sacrifice He required. No human could do it for we are all imperfect. We are all sinners … we all fail the test … we all fail to measure up to His perfection and holiness. That is why we are all going to hell. He can’t allow us in His presence because of our sin. Our sin is something which separates us from Him. Our sin problem needs to be dealt with before we can be allowed in His presence. So nearly 2000 years ago this Holy God willingly allowed man to nail Him to a cross and suffer greatly in our place to pay the penalty (the price) for the forgiveness of our sins. He shed His innocent blood to provide what was required to cleanse us from our sin and make us clean before Him so we could be acceptable to Him. Yes, as I read God’s word the Holy Spirit was dealing with my heart and I understood all of this. I was broken before this Holy God as I realized that my sin was against Him … rebellion … and I was on my way to hell because of it. I also understood that God was offering me an opportunity to be saved from this fate and I needed to accept what He was offering me. In brokenness I repented of my sin and called on the Name of the Savior to receive this gift of eternal life He was offering to me. Repentance is key in this. God requires it. It’s not an option. If we are not willing to repent there is no hope for us. Indeed there is no salvation for us. Repentance can best be described as turning around. We are walking along thru life doing our own thing … going our own way … doing things our own way and it is all what we want and in accord with the dictates of our sin nature which is rebellion against God. When Jesus created us He gave us free will … the ability and freedom to choose what we will think and do. That was the greatest expression of His love He could possibly give us. Otherwise if we were preprogrammed by Him to think and do exactly what He wanted we would be like robots. Along with this free will is accountability to Him and we are responsible for what we think and do. We will all someday stand before the Lord Jesus Christ in judgement and be held accountable. So repentance is a decision and action … to stop doing things are way and to start doing things God’s way … to start doing things which are pleasing to Him and stop doing those things which are not pleasing to Him. It’s that simple! However, we can’t do it in our own strength. We need His help and He offers it freely. So He gives us the Holy Spirit and His word to live a life pleasing to Him. Yes, in repentance and brokenness I said a prayer to the God I then knew was real and Who loved me so very much that He was willing to die in my place so that I could have this eternal life with Him. I don’t remember the exact words to that prayer but the words are not nearly as important as the sincerity of our hearts. You can pray this prayer or one of your own. God is real and loves you. He doesn’t want you to go to hell but you will unless you deal with Him on His terms concerning your sin. It is not a matter of what religion or church denomination you belong to that saves you. God hates religion. He is all about relationship not religion. Religion is man made and nothing about it is pleasing or acceptable to God. I had an advantage over some folks in that I did not have any “religious background” to deal with. I had no teachings or religious practices to cloud the issue. All I had was all that was and is needed … the pure unadulterated word of the living God. People who have such things in their lives are the hardest people for God to deal with. They tend to believe those things which have been taught to them by their particular group they are a part of and much of it is not in accord with what God’s word has to say. It, in fact, may be damning and keep them from ever coming to a saving knowledge of God. I would encourage anybody to set aside what they have been taught and the religion they might have grown up in and simply go to God’s word with an open mind and receptive heart asking Him to reveal His truth to them. Now I want to point out some things I have learned in hope it will help someone understand better about some spiritual matters. When all a person has going in their life is religion it is a rather miserable life in that they live by some rules handed/dictated to them … rules they are supposed to obey because if they do then they are hopeful that they are acceptable to and have the approval of God and their fellow man. That will never work as God has said that all our own righteousness is as filthy rags in His sight. We can never do anything in and of ourselves to win God’s favor and acceptance. Since we have no righteousness of our own we need His righteousness which only comes thru our being in right relationship with Him thru the born again experience God’s word tells of. And when we are in relationship with God, the Father thru Jesus, the Son (the second Person of the Holy Trinity) then He imparts His righteousness unto us. Furthermore we will love God because we understand that He first loved us and demonstrated (proved, showed us) His love by dying a cruel death for us so we don’t have to pay the wages of our sin which is eternal damnation in hell. And because we love God we want to please Him by obeying those things He commands of us. It is an altogether different matter … wanting to (true Christianity) vs. having to (religion). That night in my apartment as I was reading the Gospel of John and the Holy Spirit (the third Person of the Holy Trinity) was dealing with me I felt the heavy burden of my sin weighing down on me and I felt terrible over my sin realizing that it was such an offense to God. And as I realized the price He paid to provide my forgiveness I was further overwhelmed. But when I called upon His Name and said the sinner’s prayer asking Him to forgive me and come into my heart He did just that … making Himself very real to me. I immediately felt the heavy burden of my sin lift off of me and I felt clean before God … I had His righteousness. I was born again just like Jesus said. I was a new creation and the desire for the old things and ways diminished greatly right away. My spirit was made alive and was now able to understand and receive the things of God. I had just experienced the first of God’s miracles in my life. From there I told others about what happened to me and I have continued to until this day. I was hungry for God’s word and studied it hour after hour learning all I could take in. Like a new born baby I needed to be fed my spiritual food. And as I grew in the Lord I needed to switch from baby spiritual food to solid spiritual food. It is a process just like a human baby in the physical realm … going from milk to strained food and then onto regular food. So reading and studying God’s word is something needed daily. And talking to God in prayer is another important part of this new life in Christ I was now living. Worshiping and praising God in song is another aspect. He is worthy of our praise and worship and desires it of us. Upon getting saved another very important part of my new life was being in fellowship with others who love God and share this same faith I now had. So I started looking for a church asking God to speak to me as to where He wanted me to be in fellowship. In time I found the church and attended faithfully and soon started serving the Lord in my church. This all started in April 1977 and my life truly turned around. I no longer have some of the same interests I had before nor do I do some of the things I did before. Yet God allows us to be ourselves … who we are. He simply wants to improve us and will if we cooperate with Him. This new life in Christ is full of joy, meaning and purpose as Jesus came to give us life and that life is more abundant than anything we could ever imagine. 7) It is a very dangerous to delay responding to God’s offer of forgiveness for none of us know what will happen in future time … we could die seconds from now and miss out on the opportunity we have this moment. It is too late once we breathe our last breath and our heart stops beating. Our fate is sealed at that point. What will you do with Jesus? Someday your heart will be asking … what will He do with me? Wow awesome story, thanks for sharing. I enjoyed your testimony. Jesus is Lord! I went through a lot of the things that you did and wound up with the same solution. I was gloriously saved by the Lord! I didn’t denie the existence of God, I ignored Him until one night he got my attention. Brother, I love your testimony, and thank you for your BOLDNESS to share the love of Christ to all that will hear (read on here). Continue being what Jesus called all that follow Him to do; Salt & Light to this decaying & dark world; As you know (and for those who don’t) salt was used to slow the process of decay (they didn’t have refridgerators back then), and light was to light the way of the path that they walked. The Bible speaks of two “paths” that all people will walk; First, it speaks of the straight & narrow path; which leads to life (Eternal Life). Second, it speaks of the wide & broad path; which leads to death (Eternal Death~ Hell & the Lake of Fire). Jesus, said: I AM the Way, the Truth and the Life; and no man comes unto the Father but by (or through) Me. He (Jesus) is that Narrow Path; All other paths lead to ETERNAL DEATH & HELL. I am touched by your story and encourage you to keep you faith and good works. No Gods, No Masters! There is no evidence of a god and no evidence that Jesus ever existed. What a sad comment. Satan has you so deceived, Your hard heart prefers to believe his lies over the truth. There is ample evidence all around you yet you reject it not realizing that someday you will stand before Jesus in judgement and you will be without excuse. I am praying for you Ron … that your eyes will be opened and your heart melted so you will understand and recognize the truth … that there is a God Who loves you and demonstrated that love by dying a cruel death on a cross that your sin could be forgiven and you could spend eternity with Him instead of experience the wages of your sin which is eternal damnation in anguish in the lake of fire God warns us about. I’m sorry that you are still blind and dead spiritually to the facts of the LORD. Our very dates testify to Jesus. Read John 3:16-20 & 36. Chic publications was a good reference quite some time ago but as with all publications Chic went awry and off the deep end with constant barrage of anger against the Roman Catholic church and others. Not someone I would put down as a reference now. Other than that ,,interesting testimony. I could not agree with you less. Chic tracdts are “right one” concerning the false religion of Roman Catholiiscism. There is a Spirit of Truth and there is a spirit of error.and we need to be discerning. Awesome. Great encouragement for my “pre-saved” sister. Thank YOU, and thank you for the God, who will make a way, when there seems to be no way. Amen. Dear Developer of great looking trike canopy. I read most of your story and can identify with much of it. I too served in the navy, in Vietnam with Seabees, and aboard the USS Stribling DD 867. Upon returning from the military I also felt lost but God found me, asked me to come back and visit. First I am not the developer of any canopies. I don’t know where you got their idea. I have operated with the Stribling many times while aboard the Perry (DD-844). I don’t understand your statement about God asking you to come back and visit as it makes absolutely no sense at all. God calls individuals to repentance and a life of commitment to love, follow, serve and obey Him … not to visit Him.